This year marks the 800th Anniversary of the sealing of the 1215 Charter of Liberties (Carta Libertatum). A subsequent derivation of this document, commonly referred to as the Magna Carta, was sealed in 1217. The importance of the principles enunciated in the Magna Carta cannot be overestimated, including its influence on common and constitutional law, as well as political representation and the development of Parliament. The Magna Carta still forms an important symbol of liberty today. The original charter, it is often claimed, embodies the principles and values that underpin the emergence of parliamentary democracy and the legal system in the UK, in the free world more generally, and especially in Australia: limiting arbitrary power, curbing the right to levy taxation without consent, holding the executive to account, and affirming the rule of law. These principles are the foundation of Australia’s own ‘Birth Certificates’, including the Commonwealth of Australia Constitution Act 1900 (UK), on display at the National Archives of Australia. Magna Carta and the liberties it guaranteed are fundamental to the values we have cherished for centuries. In our Australian democracy, are these principles far too often taken for granted, and often not fully understood? Is it widely understood they are the foundation stones of our major institutions, notably our Parliament and our courts? Are they values that should continue to unite us all? Is it important to fight to uphold these values? Especially these days, when they are being challenged by those opposed to the rule of law? 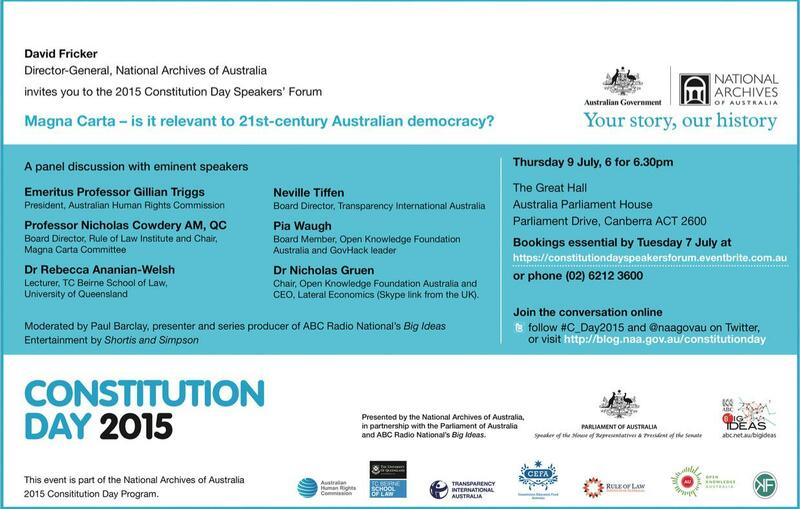 Magna Carta – Is it still relevant to 21st Century Australian Democracy?